There are big differences in environmental impacts of commercial roofing materials, but the biggest variable may be service life. This standing-seam metal roof includes thin-film solar laminates. 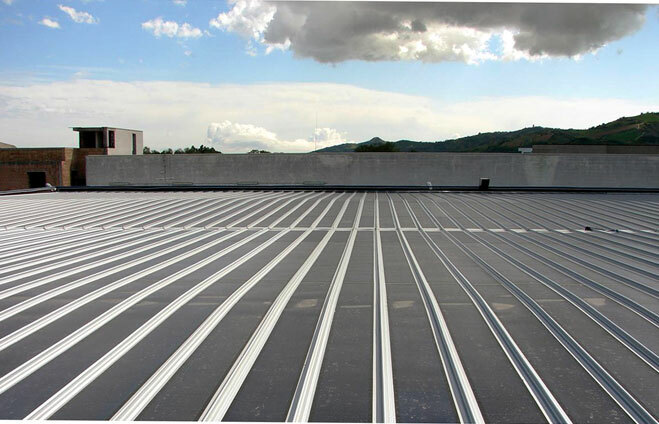 Kalzip uses a mechanical zipper systemalong with butyl-based sealants to provide the mechanically seamed, hydrostatic joinery required for a watertight metal flat roof. Metal roofs are fully recyclable and contain high recycled content. The ideal roof system would have a long service life, keeping overall life-cycle costs and environmental impact down. It would contribute to the energy efficiency of the building, keeping you comfortable year-round without wasting energy. It would use low-impact, recyclable, low-toxicity materials, so you don’t shelter yourself at the expense of your neighbors and the environment. And in an ideal world, you would get it all at a low cost. Unfortunately, this type of roof doesn’t appear to exist today, at least for the acres and acres of low-slope commercial rooftops that crown so much of our built environment. And while the last decade has seen plenty of progress in reducing the impact of roofing, there’s still plenty of room to improve. In this article we’ll examine life-cycle impacts, health and environmental hazards, and durability of low-slope roofing options, focusing particularly on the increasingly popular single-ply membranes and honing in on key questions, such as when and where reflective roofing is the best option and whether past performance concerns with newer membranes remain a problem today.